Today’s meal is at San Camilo market in Arequipa, Peru. After arriving in Arequipa, I started searching online for good cheap food. From GQ Trippin, I found out about San Camilo market. It seemed like the most amazing place for affordable and yummy food. I expressed my interest in the market to my Spanish teacher to ask his opinion as a local. He discouraged me from going because I might get food poisoning. Next, I told fellow student/ posh Russian-American Tasha (not her real name) about the market and she turned her nose at it, adding that the “food there is rough” (aka not refined enough for her palate). What is a poor glutton to do? Visit the market on my own of course. Everyone tells you to eat at the stalls with the longest line of locals, but an important addition to that is to opt for the stalls with women and children in line, too. More variety in the customer base usually means the stall has been vetted enough that it’s safe for everyone. Yes, it’s still better to choose a long lineup of men over crickets and an empty stall, but given the choice, women and children in line is where you want to go. The market was easy to find after I had the directions from my teacher. The cobbled streets of Arequipa were not kind to my shoes since I kept slipping on it. 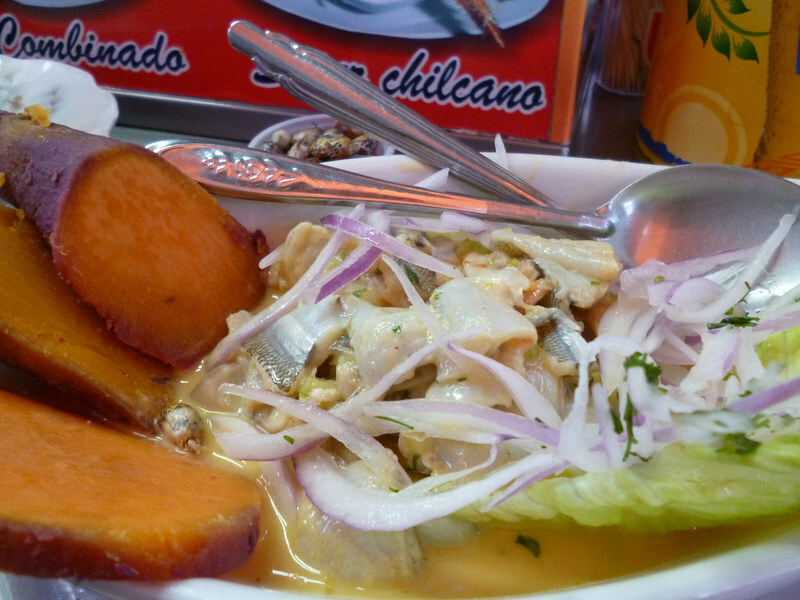 In the market, I walked past several ceviche stalls several times because I was too shy to sit down at any of them. Finally, I saw the stall that looked like where GQ Trippin ate and luckily a family just left their side of the table. I sat down and smiled at the ladies working at the stall. 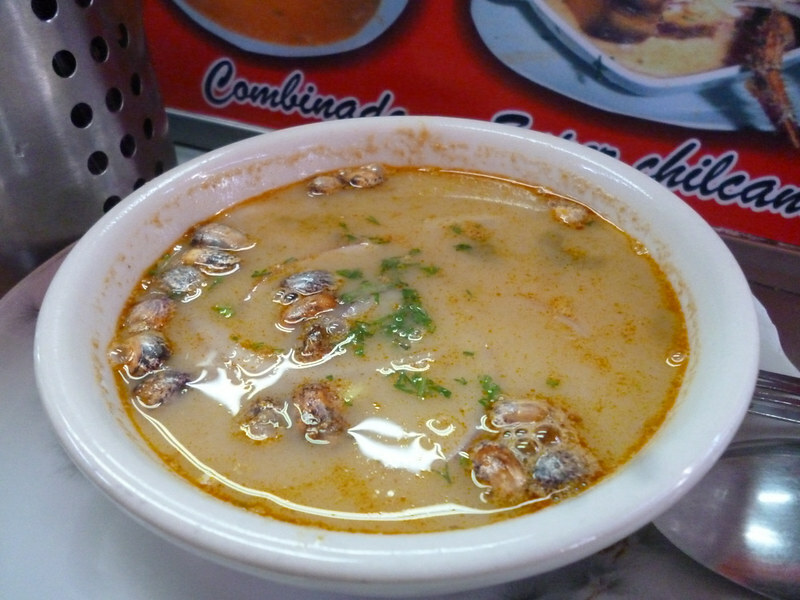 Using my still-limited Spanish, I asked for ceviche and something I had no idea what it was. 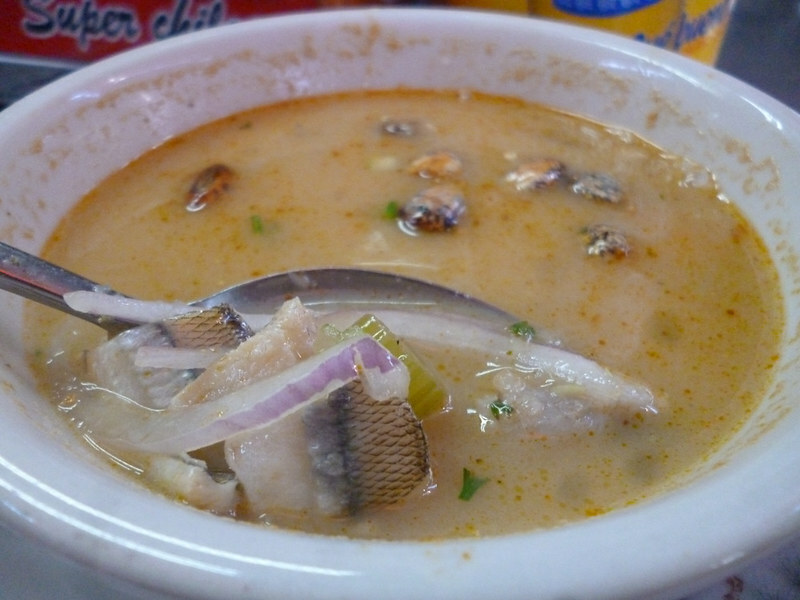 Now, I think it might have been fish soup because it’s a soup and it has fish inside. Next was the ceviche. 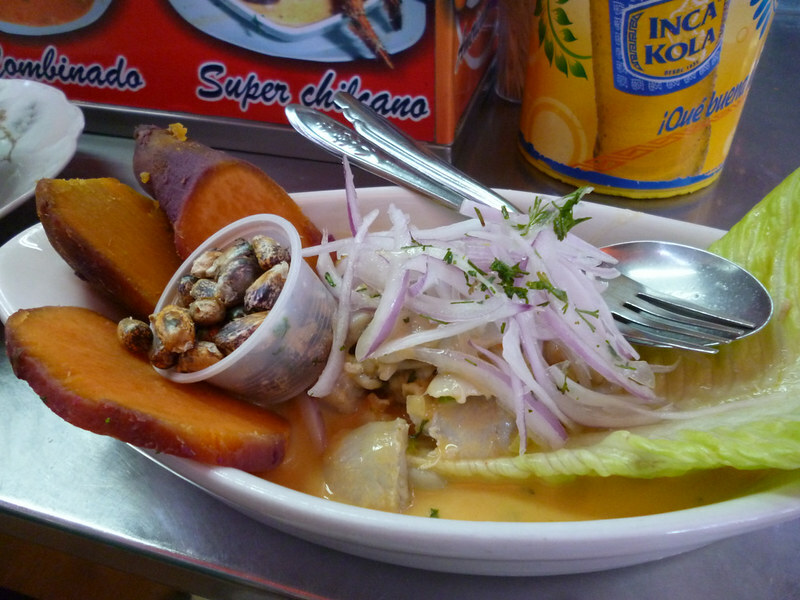 Ever since eating ceviche in Buenos Aires, I had been dreaming of this raw fish dish. But since Arequipa wasn’t even near the sea, I hesitate eating it. Still, my gluttony overcame my good sense. They definitely used a different fish at the market compared to my delicious meal in Buenos Aires. I wasn’t satisfied with the tiny bits of fish which were dwarfed by the large sweet potato. Of course I should have known that carbs are more important than decadent protein. After the stomach-bursting meal of soup and sweet potato, I still walked around the market. 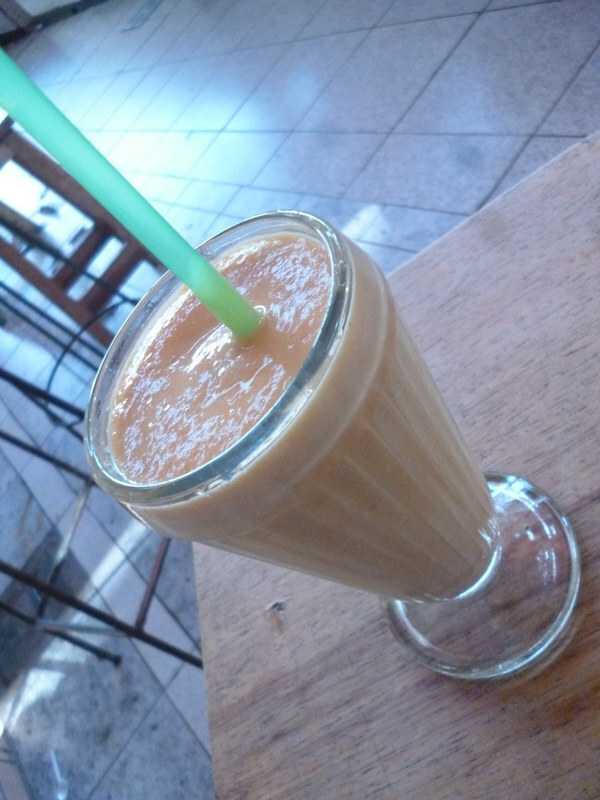 I stopped by one of the drinks stall and ordered a “surtido con leche” (which is a mix of unknown fruits). The vendor poured one large glass for me. When I finished my glass, she poured another glass from the same batch. Turns out there are two servings with that price. I did not get food poisoning like my teacher thought I would. If the locals are eating it, it’s probably safe enough to eat it too. I ate years there and never had any problem. Good for you! I didn’t know why my language teacher would think that I couldn’t handle the food there.